The Russian Defense Ministry approved an armor development concept. All light armored vehicles (infantry fighting vehicles (IFV), armored personnel carriers (APC) and others) will have new maximum caliber of 57mm. The guns will be universal and will destroy tanks and down drones. The light armor with 57mm guns will have an edge against other combat vehicles of the class, the Izvestia daily writes. The Defense Ministry told the newspaper the new armor concept was approved this year. It was preceded by R&D which confirmed the feasibility of arming the vehicles with 57mm guns. At present IFV and APC are armed with 30mm or 100mm launchers. The latest armed conflicts showed they are not always effective against high-speed and armored targets. The more powerful 57mm gun will help Russian light armor fight APC and IFV and any adversary tank. It will destroy sights, heat imagers and other outside equipment or destroy highly protected Abrams tank by a side hit. Armed jeeps and drones frequently become the main targets rather than hostile APC or IFV at present. They have to be destroyed at maximum distance with a minimal number of shells. The infantry mounted on light vehicles shall be denied a chance of the first strike with antitank guided missiles, while drones shall be barred from transmitting information to the command post. The Russian defense industry has designed hardware that meets the latest combat requirements. 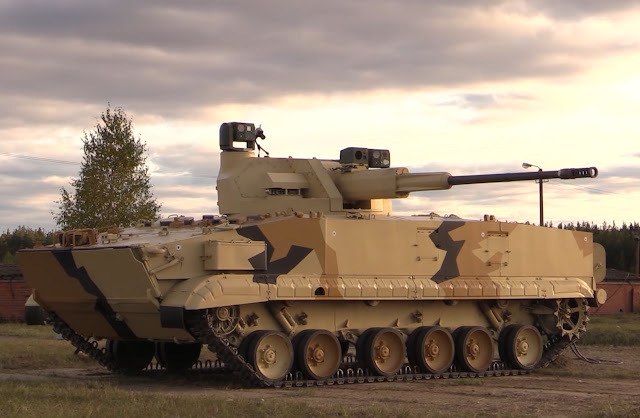 BMP-3 and BTR-82 can be armed with 57mm automatic remotely controlled Baikal AU-220M artillery module. It has a high rate of fire up to 120 rounds per minute. The same gun can be mounted on heavy tracked BMP T-15 platform created on Armata basis. Unmanned Kinzhal combat module has been designed for it. Its gun can fire to a distance of over 14 kilometers. 57mm guns are known as reliable antiaircraft weapons. The Soviet Union produced ZSU-57-2 self-propelled guns which were used in the war in Vietnam, Arab-Israeli and Iran-Iraq wars. ZSU had to destroy jets, but the absence of an automated radar decreased the effectiveness. The Russian defense industry coped with the problem. The prospective self-propelled Derivatsia-PVO with 57mm gun on BMP-3 undercarriage will be dangerous for helicopters and jets. A 57mm guided shell has been designed and is being tested to destroy low-signature and low-flying targets like tactical drones or MLRS projectiles, cruise missiles and other precision munitions. The new guns will increase the firepower of the ground forces, expert Sergey Suvorov said. "He who rapidly fulfils the fire mission wins the modern war. 57mm caliber produces higher precision, destructive effect and armor-piercing capability than 30mm guns," he said. It has to ensure superiority of Russian hardware over foreign APC and IFV for years to come, the Izvestia writes. At what point does it no longer make sense to go bigger? A 30mm gun can engage and defeat anything lighter than a MBT. That includes the latest thinking on Medium Tanks. If a 40mm or 50mm or 57mm delivers the same "basic" performance against vehicles then the difference would have to be against building, troops etc. But even if that's the case then wouldn't mortars be a better option? I just wonder if the drive to upgun IFV/APCs makes sense...Are we seeing the age old pistol debate but just taken to armored vehicles? The FBI had a Miami shootout and abandoned the 9mm round. The march of time and trying to upgun, along with better performing ammo has brought them full circle and they've readopted the 9mm for use. Will we see the same after the latest craze subsides in the armored vehicle market?